After watching Wrigley Field turn into a piss-soaked hellscape on opening night, the Chicago Cubs are taking steps to replace the bathroom facilities that have been knocked out by the ongoing construction at the stadium. 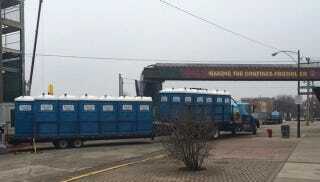 Here come the portable toilets to save the day! The picture above, taken by the indispensable @WrigleyRenovations, is just perfect. Making the confines friendlier indeed! There’s no word yet on exactly how many portable toilets will be trucked into the stadium in time for tonight’s game, or where exactly they will be located. If you’re going to be at Wrigley tonight and you feel like sharing some photos with us, hit us up at tips@deadspin.com.